After being pulled from his most recent fight, heavyweight mixed martial artist Mark Hunt is back in the game. 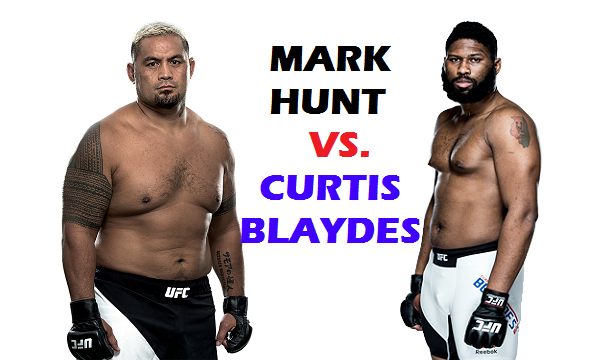 Hunt will meet rising star Curtis Blaydes at UFC 221 at the Perth Arena in Perth, Australia. Hunt was set to fight Marcin Tybura at UFC Fight Night 121 when the UFC pulled him off the card citing concerns for his medical well-being. Hunt had gone on record in an interview saying that he was having CTE related symptoms. The UFC demanded tests to be conducted, and replaced him with former UFC heavyweight champion Fabricio Werdum. Once pulled, Hunt went on a social media rant against UFC President Dana White and the organization, creating more distance between the two. Now cleared, Hunt will have his hands full with Blaydes. ‘The Super Samoan’ is coming off a fourth round TKO win over Derrick Lewis in June. Blaydes now a top-10 heavyweight has four straight wins with victories over Adam Milstead, Daniel Omielanczuk, Aleksei Oleinik, and Cody East. The Milstead victory was later overturned to a no-contest. Blaydes was suspended 90-days and ordered to pay a $1,000 fine for a U.S. Anti-Doping Agency infraction. Blaydes had tested positive for trace amounts of marijuana. UFC 221 is headlined by a middleweight title matchup between champion Robert Whittaker, and former champion, Luke Rockhold. The event takes place February 10, 2018 (February 11 local time).